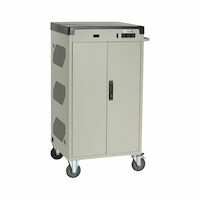 Charge and store 30 or 36 assorted devices in these carts that provide the best value for years of reliable charging. With adjustable shelves and either 19" or 23" rackmount rails, these future-proof carts let you just change the shelves when you change devices. Industry-leading features give you the best value anywhere in Charge carts.